VBReFormer is a powerful and essential recovery tool for Visual Basic 5 & 6 application. Decompiler, disassembler and design editor at the same time, VBReFormer is an essential tool for professionals and companies who work with older versions of their Visual Basic 5/6 applications. VBReFormer will help you to rewrite your application by recovering all necessary information, design code and partial native Visual Basic code of your application. VBReFormer disassemble all functions and methods in forms, controls, classes, and modules of Visual Basic application and try to recover the most complete Visual Basic source code than possible (if compiled with the native code option). Furthermore, thanks to its integrated decompilation engine, VBReFormer perfoms a decompilation from Native code to Visual Basic code, in the fullest extent possible. VBReFormer recovers UI meta information and resources of Visual Basic 5 & 6 application (forms, usercontrols, designers, pictures, etc.) and extracts these information into a Visual Basic project. Even better, the integrated design editor of VBReFormer succeeds where others resources editors fail with Visual Basic applications giving you the ability to edit UI design of Visual Basic applications in a simple and easy way with no limitation of size, and with no need to recompile the application, working directly on its binary. As annouced previously, we just release the Free and Professional editions of VBReFormer 6.4. This new version improve such a lot the decompiler engine and this is one of the most important release I’ve done until now. The decompiler engine has been improved as it can now perform variable type determination. This means that VBReFormer is now able to guess the type of a variable and argument from its use inside the code. We also added for/next support, and multi-dimensional array-related statements decompilation. Fixed issue on default language setting (French was setup by default, now replaced by English language). You all know that Visual Basic 6 allows you to choose between Native Code and P-Code compilation. Because one of the most recurrent questions of my customers was if VBReFormer Pro will support decompilation of their application, due to the simple fact they don’t know if it was compiled in Native or P-Code, I’ve made a tool called “VBCompTester”, some years ago, which show you if a binary file (.exe, .dll, .ocx, etc.) was compiled using Visual Basic 5 / 6 and with what compilation mode (native or P-Code ?). I have also made this tools because VBReFormer Free edition was not supporting decompilation at all, while VBReFormer Pro does. Then, you were not able to know, by using the free version, if the Pro one will support your application. But the past year I decided to make VBReFormer Free and VBReFormer Professional from the same wood in order to give a real idea of VBReFormer Professional capabilities by using the free version. Then, since June 2014, the both version of VBReFormer, free and pro, have the same features, but limited in the case of the Free edition. decompilation engine will not show name of code-inside object property in Free Edition. It will show something like “Me. [PROPERTY NOT VISIBLE IN FREE EDITION]” or “Me. [METHOD NOT VISIBLE IN FREE EDITION](param1, param2, param3)” in free edition; the feature of edition of GUI interface is not supported in Free Edition. Since the Free Edition can now be used has a demonstration version of the Professional Edition of VBReFormer, I decided to discontinue the tool VBCompTester. You can, and I advise you to use VBReFormer Free edition in order to know if your binary is made with Native or PCode option. If you want to know more about the difference between the both compilation modes, you can read the following article: The truth about Native Code VS P-Code. See you very very soon with a new version of VBReFormer which is gonna be the most powerful version I have made. I’m delighted to announce that we’ve released VBReFormer 6.2 Professional Edition. – Improved support of GUI Code for ActiveX / OLE related objects. – Fixed issue in adding a new property to a GUI object . This article has been written to provide a better and essential information to users of decompilers since I got many complaints from customers of others Visual Basic decompilers because their application weren’t recovered by these decompilers. The reason is, when you write a Visual Basic 6.0 application you may choose a P-Code or Native code compilation, then your application will be compiled to P-Code or Native code which are very different approaches of compilation, so the decompilation will be different too. There is a question you may absolutely ask yourself when you need a decompiler for a specific application: Is my application compiled into native or P-Code mode ? When you write a line of code in the IDE, Visual Basic breaks it down into expressions and encodes the expressions into a preliminary format called op-codes. In other words, each line is partially precompiled as it is written. Some lines contain shared information that cannot be precompiled independently (mainly Dim statements and procedure definitions). This is why you have to restart if you change certain lines in break mode. The opcodes are compiled into p-code instructions when you compile (in the background if you have the Compile On Demand and Background Compile options set). 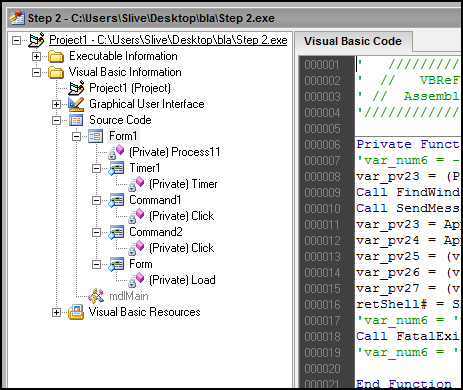 At run time, the p-code interpreter works through the program, decoding and executing p-code instructions. These p-code instructions are smaller than equivalent native code instructions, thus dramatically reducing the size of the executable program. But the system must load the p-code interpreter into memory in addition to the code, and it must decode each instruction. It’s a different story with native code. You start with the same opcodes, but instead of translating to p-code instructions, the compiler translates to native instructions. Because you’re not going to be expecting an instant response while stepping through native code instructions in the IDE, the compiler can look at code from a greater distance; it can analyze blocks of code and find ways to eliminate inefficiency and duplication. The compiler philosophy is that, since you compile only once, you can take as long as you want to analyze as much code as necessary to generate the best results possible. These two approaches create a disjunction. How can you guarantee that such different ways of analyzing code will generate the same results? Well, you can’t. In fact, if you look at the Advanced Optimizations dialog box (available from the Compile tab of the Project Properties dialog box) you’ll see a warning: “Enabling the following optimizations might prevent correct execution of your program.” This might sound like an admission of failure, but welcome to the real world of compilers. Users of other compiled languages understand that optimization is a bonus. If it works, great. If not, turn it off. On the other hand, very few developers are going to be used to the idea of working in an interpreter during development but releasing compiled code. Most compilers have a debug mode for fast compiles and a release mode for fast code. Visual Basic doesn’t worry about fast compiles because it has a no-compile mode that is faster than the fastest compiler. You get the best of both worlds, but it’s going to take a little while for people to really trust the compiler to generate code that they can’t easily see and debug. 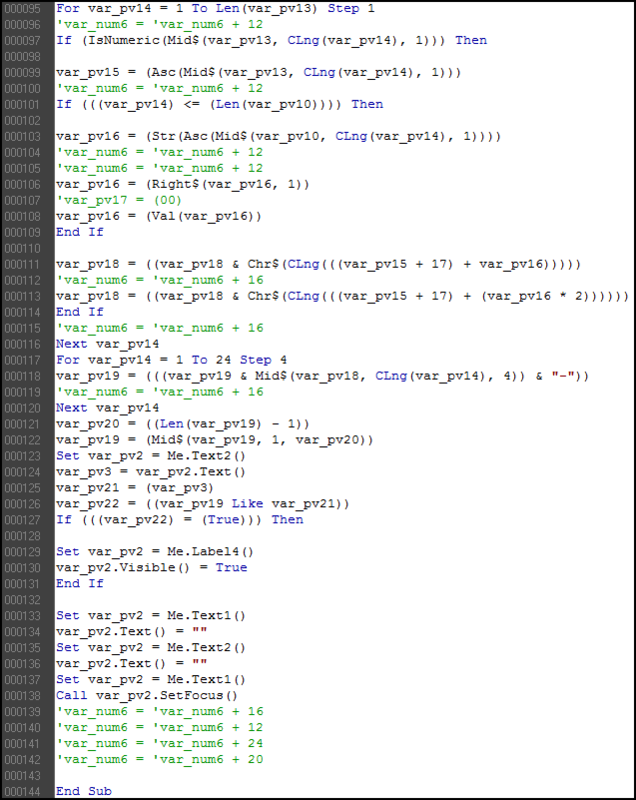 The amount of P-Code developed application is very small compared to Native Code developed application (90% of Visual Basic 6 applications are compiled with Native Code setting -default setting in VB6-), that is one of the reason why I decided to develop VBReFormer more for Native Code than for P-Code. The massive number of Visual Basic Native application compared to P-Code applications is probably more important due to the fact the default value in the compiler is set up to « Native Code », and of course because native application are almost fast than C++ applications contrary to P-Code applications. Before choosing a decompiler you must know if it was released for Native application, or for P-Code applications, and if your application was released in P-Code or Native mode. Note that P-Code is more easy to decompile than Native Code because of it’s high level property. Now that VBReFormer is a well advanced decompiler for Visual Basic application, I was searching for some unsolved crackmes in order to made sample of decompiling for learning purpose. The website Crackmes.de contains an impressive number of crackmes applications, a perfect source of samples. For the first sample of CrackMe solving with VBReFormer Professional I decided to take “Step 2” from yudi (more informations). I will show you, step by step, how it’s simple to solve the yudi’s Step 2 using VBReFormer Professional. 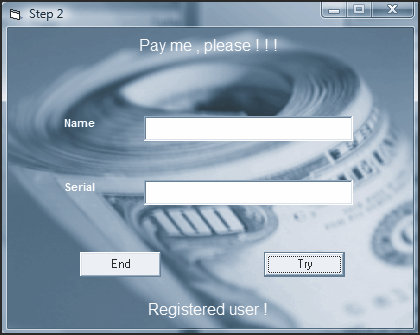 We can see that a serial is generated using the name of the user. How the serial is generated? See the following step. We will now take a look to the first method loaded on Visual Basic application. We can see on this capture that the “Label4” visibility is set to False (not visible) at the beginning of the application. We now need to know where the “Label4” control visibility is set to true, and what does the “Timer1” control. The analysis of the Timer1 control is interesting but not very useful for the following of this tutorial. We can see here that the “Timer1_Timer” function is called every second by “Timer1” control in order to check that no debuggers, and if one is running, to close it. We can note that it also close any MessageBox windows. Now we are looking for the code under the “Try” button which check if the key match with the name. The algorithm seems a little complicated for newbie, but complete and without any syntax and source code error from VBReFormer. That’s a great thing for us; we will be able to test the application into the Visual Basic IDE later (to make a key generator for example). This part of code is showing us that the key is generated from the Name, but also with the Date and the Time ! That’s meaning it’s almost impossible to generate a key that does not expire the following second. In order to made the Key Generator, save the project with VBReFormer, and open it with Visual Basic 6. These block are showing an alert when the “Name” field and when the “Key” field are empty, but it’s not usefull for a keygen. That code is checking that the serial (stored in var_pv19 variable) generated from the name with the algorithm is the same than the one entered in the “Serial” field (Text2.Text). 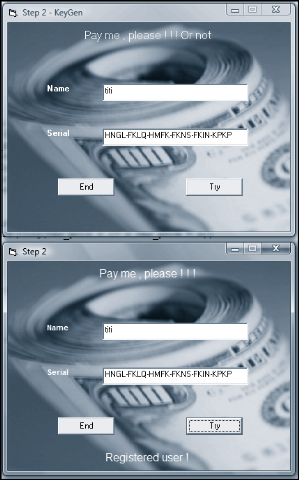 The first window is the windows of our KeyGen created from the original crackme, and the second window is the one of the original Crackme, with the key from the KeyGen. The result is that our keygen work perfectly! Just note that the use of date and time make your key valid for only 1 minute after having generated it. Is it possible to bypass that limitation? Yes it is ! In fact, to get the “Registered user!” message you even don’t need a key generator. By reading the code you can see that the operator used to perform a comparison between the both string key is the “Like” operator. Drop a Visual Basic binary (.exe, .dll, .ocx) here or click to check if your binary is compatible with VBReFormer. Great ! VBReFormer is fully compatible with your exe file. Try it now for free !. Warning! Your binary is a PE Executable but it's compiled with P-Code option. For that reason, VBReFormer will only be able to analysis Visual Basic GUI and metadata. It will not be able to fully decompile your executable..
Oh no! Your binary is not compatible with VBReFormer. 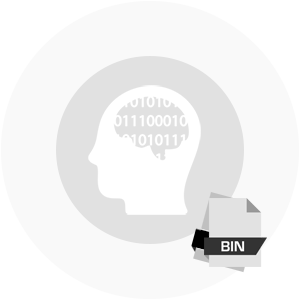 Qiil.io is a research project focused and highly specialized on software reverse-engineering fields. Born from an initiative of S. Bruyere, software architect and security researcher, best known for his work in the Visual Basic-x86 reverse-engineering fields. His most notable work is VBReFormer, disassembler and decompiler for Visual Basic 5 & 6 applications. © 2017 - All Rights with Qiil.io.